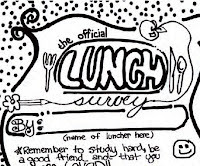 Check out this fabulous lunch box survey form (pdf) from FamilyFun that you can print out and include in your child's lunch box. What a clever idea! 1 - 'HERE FIDO...' "
HA! I think "I traded it for _________ " should be one of the options. My son would hate the absolute utter cuteness of this form, but I bet there are kids out there who would love it. If anyone gives it a try, let us know how you rate! Thanks, Chelee, for the link! Indonesia: land of tempeh! I absolutely adore tempeh. It's got a nutty, mushroomy flavor and a very impressive nutritional profile. For those who haven't met tempeh yet, tempeh is made from cooking and fermenting whole soybeans until they form solid cakes that can be cut into slices and steamed or fried. It's got more bioavailable protein than tofu or plain cooked soybeans, and the fermentation of tempeh makes it easier to digest. Thank you, Indonesia! Today I fried my tempeh and then coated it with a glaze made from brown sugar, soy sauce, shallot, and red chile. Sweet and spicy! Next to the tempeh is Indonesian Yellow Rice: rice cooked with turmeric, lemongrass, and coconut milk. This dish is prepared in Indonesia for festivals and sacred occasions. It is often shaped into a cone to represent the sacred mountain Meru. I garnished my cone attempt with a fresh chile cut into a flower blossom. Beneath the rice is a simple Indonesian vegetable pickle -- carrot, cucumber, and shallots pickled with vinegar, sugar, and salt; very easy, sweet and crispy. And for dessert, two little clementines. Citrus was appropriate, as there are more varieties of citrus fruits in Indonesia than I have ever heard of in my life. Verdict: The pickles were my favorite part, crunchy and addictive. The tempeh and rice were good together, but I really can't wait to eat all the leftover tempeh on top of a big green salad; that's my favorite way to eat tempeh. 4 stars. Isn't it cute? What a great appetizer to bring to a holiday party, with a healthy vegan dip on the side (I'm thinking hummus, Yumm! Sauce, vegan ranch, guacamole...) You could even substitute some carrot sticks for the pretzels. The magazine had several other healthy-sounding vegan appetizers: Fig Spread, Salsa-Lime-Bean Dip, Roasted Green Beans, and Lettuce Bundles. Wow, who knew? 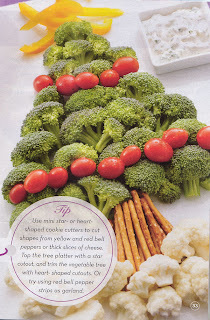 Are any of you planning to bring healthy vegan dishes to holiday events? P.S. Speaking of Pillsbury, aren't some of their products "incidentally vegan"? It seems to me I remember picking up a package of their refrigerator crescent roll dough or something, and noticing that it was oddly animal-free ... then carefully setting it back down and backing slowly away. "I wanted to let you know that we are running a Holiday Discount now through the 16th of December. We are giving 20% discount on purchased items. The code is holiday2008. We get so many people who say they heard about us through you so we thought your readers might be interested." There you have it! I bet some good little boys and girls (and some good big boys and girls, too!) would be delighted to find Laptop Lunch Boxes under the tree. What's Santa Shmoo giving to all the good girls and boys? I usually bake homemade sweets for all our neighbors and friends at the holidays, but this year I decided to give everyone Gourmet Red Wine Soup Mixes instead. My friend Renee makes these soup mixes -- all natural, all vegan, low in sodium (hooray! ), and yummy, too. You just add water or broth and they're done in less than an hour. My favorite is the Red Wine Vegetable Bean (I like adding cooked brown rice and baby spinach to it). I'm putting them into little gift boxes for my friends and family along with a package of crackers and some fresh clementines. I hope people don't mind the healthier gift this year. 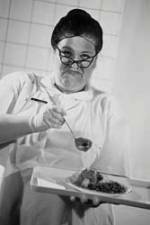 With all the diabetes, heart attacks, and high blood pressure I've been a witness to this year, I couldn't bear to make everybody another batch of cookies and fudge. 2. 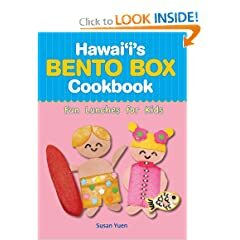 For the bento fan: Hawaii's Bento Box Cookbook: Fun Lunches for Kids is about the cutest thing going. If you love to coo over lunches that look like teddy bears, princesses, mermaids, or little mice, this is the book for you. 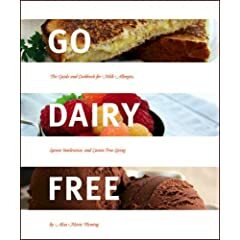 I have to warn you, the recipes are not vegan, but that shouldn't stop you from using this book for inspiration; substitute vegan deli slices and cheese and white veggies like jicama or daikon for the bologna, cheese, and fishcake in the designs. 3. For the athlete: For information about vegan athletes and nutrition, check out Thrive: The Vegan Nutrition Guide to Optimal Performance in Sports and Life by professional Ironman triathlete and vegan, Brendan Brazier. His book offers up sound advice for athletes along with all-natural recipes for gels, sports drinks, smoothies, and bars. That's all the new books I can think of for now. What are some of your recommendations? P.S. My book (ahem) would also be a great holiday gift for all the vegans and lunch-packers on your list! How was your Thanksgiving, vegan America? I hope it was delicious! 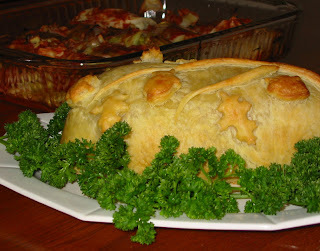 Once again this year I made my Mini-Wellington recipe (from Vegan Lunch Box) into one big Wellington for our Thanksgiving centerpiece dish. I decorated the loaf with branches, leaves, and acorns made from extra puff pastry. Isn't it pretty? This year the idea of eating transfats with my Thanksgiving feast just didn't sound like any fun, so I tried something new: at the same time I made the puff pastry version for my family, I also took the same loaf mixture (without the peanut butter or sage, plus extra Dijon), wrapped it in cabbage leaves, and baked it with tomato sauce and lemon. Ta da! Vegan Cabbage Rolls, lower in fat, healthier, and absolutely to-die-for. People who tried both even liked the cabbage version better! We also enjoyed veggies with vegan ranch dip, sushi rolls, fat-free vegan gravy and mashed potatoes, and my sister made a perfect batch of Best Brussels Sprouts. For dessert, my mom made apple pie and huckleberry pie with organic shortening in the crust. How did your feast go? Did anyone have Tofurky? 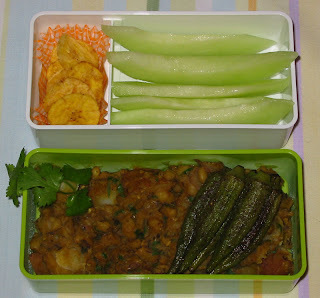 On the side is Spinach Bhaji, an Indian-style spinach recipe from the island of Trinidad. There is a large Indian influence on much of the cooking of Trinidad, where hundreds of thousands of Indians came as indentured servants to work the sugar plantations. 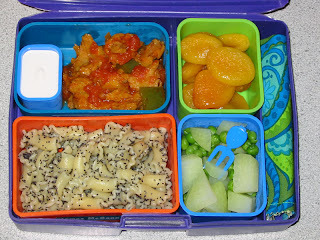 It's all pictured in a Lunch on the Go lunch box from Bed Bath and Beyond (bought cheap with the coupon!). Verdict: Seriously, best beans and rice EVER. That little touch of coconut milk transformed it from a humble meal into something so tasty and satisfying! Beans and rice and greens was a perfect combination. 5 stars. Paprika is serious business in Hungary. Unlike here in the states where paprika is paprika, in Hungary it is available in a wide range of heats from mild to hot. The sweet-hot flavor of paprika is essential in Hungarian cooking, as in this vegan version of Hungarian Chicken Paprikas -- chicken-style seitan simmered with tomato, green pepper, and paprika. A small container of vegan sour cream is on the side to stir in at lunchtime. Below the paprikas is another Hungarian dish: Noodles with Poppy Seeds. Normally this dish would be made with egg noodles; I substituted campanelle. Next to the noodles are steamed kohlrabi and peas, one of shmoo's favorite combinations. And for dessert, tender stewed apricots cooked in orange juice. Verdict: Shmoo loved the seitan chicken, but not the green peppers. My husband loved the green peppers, but not the seitan. I liked a bit of both, and we all enjoyed the noodles, kohlrabi, and apricots. Something for everyone! 3 stars. An old Russian proverb says, "You can't feed a Russian without kasha." Here is kasha kupe- cheskaya: cooked toasted buckwheat kernels, carmelized onions, and tofu (taking the place of the traditional hard-boiled eggs). I would add to that old saying that you also can’t feed a Russian without mushrooms. I have never eaten mushrooms as delicious as those made for me by a Russian immigrant friend, who told me of how they would hunt for wild mushrooms in her native country, and how mushrooms were considered an important meat replacer during the Orthodox fasts. These are chanterelles (I don't know if it's the same everywhere, but our local Costco has 1 lb. fresh chanterelles for $8.99!!). The other containers hold a small salad with dressing, a pear, and two Russian Tea Cakes (little cookies rolled in powdered sugar). And could it be? Yes, it's another new lunch box! 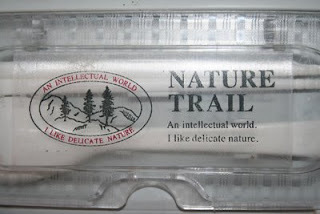 This is the new three-tier To-Go Ware container. To-Go Ware has a brand new look, with two-tier and three-tier containers and, best of all, the small stainless steel dressing containers we've all been hoping for. The new lunch boxes also come apart so you can carry just the top tier for a light snack. Verdict: Ochen' vkusno! (very delicious!) The chanterelles were heavenly, especially with the kasha. 5 stars. In the bottom container, I seasoned black-eyed peas and potatoes with touches of cilantro, cumin, and lime juice. Tender black-eyed peas and other cowpeas (also called "crowder peas" here in the U.S., because they’re all crowded together in their pods) are served all over the African continent. On top of this dish are oven roasted okra pods. I love okra so much! Here in America we tend to think of okra as a southern vegetable, but it, too, has its origins in Africa. Whole roasted pods are fun to pick up and eat with your fingers. In the top container are honeydew melon slices and a serving of plantain chips, a popular snack in West Africa. Verdict: Everyone in the family was happy with this meal, although shmoo wouldn't even try the okra (more for thems that likes em!). The plantain chips were interesting, like a cross between potato chips and banana chips. 3 stars. P.S. Speaking of plantains, have you ever visited the sad little monkey who bought the wrong bananas? Too bad he didn’t know the difference between bananas and plantains! Last week some of my girlfriends and I left the husbands and kids at home and took a trip to beautiful Portland, Oregon. It was undoubtedly the most fun I've had in a long, long time. We ate and shopped and ate some more (Nicholas Restaurant has out-of-this-world Lebanese and Middle Eastern food, btw). We stopped by Powell's Books for Home & Garden on Hawthorne Street, and look what we found! 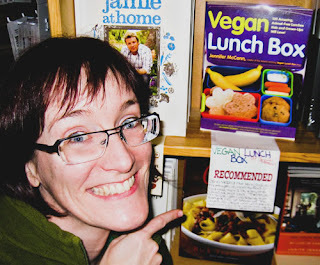 It's Vegan Lunch Box right up front, with a hand-written staff recommendation sign! Woo hoo! Powell's, you so made my day!! Hey, Dr. Fuhrman's Disease-Proof Blog has a new look beginning this week. I was asked to be a guest blogger this week; you can visit and read an edited version of my Summer Veg Out post on the wonders of smoothies. 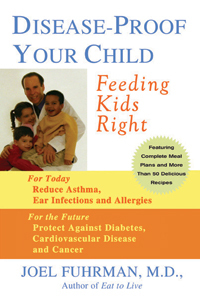 Speaking of Dr. Fuhrman, he also recently produced a new set of books and a DVD. As most of you long-time readers know I'm a huge fan of Dr. Fuhrman, so I couldn't wait to pick up a copy to review. First, I read through his new two-volume set Eat For Health. If you've read the previous books Eat To Live or Disease-Proof Your Child, Eat for Health doesn't offer too much in the way of new information. The basics are all the same: lose weight and live longer by making nutrient-dense foods the foundation of your diet, eliminating salt, exercising, obtaining healthy fat from nuts instead of oils, etc. What is new is the slower step-by-step transition to nutrient-dense eating, which may make it easier for people who are just getting started, and the attention paid to emotional issues that may stand in the way of healthier eating. As an emotional eater myself, I appreciated the acknowledgment that sometimes healthy eating is easier said than done, especially when issues of addiction and self-worth are standing in your way. Book One addresses all the basics while Book Two is made up of the exciting let's-get-to-it stuff: menu plans for each phase in the transition to healthier eating, dozens of new recipes, and information on how to shop. Next, I was absolutely delighted with the new DVD Secrets to Healthy Cooking. Dr. Fuhrman and his wife Lisa demonstrate how to make the staple dishes central to his eating style: smoothies, salads and nut-based dressings, vegetable soups (including my favorite), a stir-fry, and sorbet. The production quality is excellent, the demonstrations are fun to watch, and best of all, each recipe section concludes with a recipe template showing you how to make up your own recipes using his model. Brilliant! 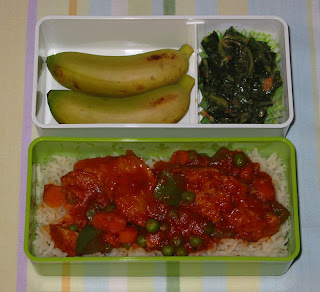 Here is a little lunch box ode to Africa. Jollof Rice is a dish served in many West African countries, including Liberia, Nigeria, Senegal, and Gambia. I replaced the traditional chicken in the dish with chicken-style seitan, and cooked it in a base of tomatoes, tomato paste, ginger, onion, and green pepper, along with peas and carrots. On the side is a dish of cooked collard greens served in a very African way: with a spoonful of peanut butter! Peanut butter, called groundnut in Africa, is added to a lot of savory dishes in ways we wouldn't expect here in America. It adds creaminess and flavor along with extra protein and fat. For dessert I packed two more of those lovely baby bananas, which our guests from the African Children's Choir said were just like the ones in Uganda. I will always think of that now when I see baby bananas! Verdict: My husband and I agreed, this was one of those dishes that you just didn't want to stop eating -- soooo good!! Shmoo was happy after we handed him almost all our big chunks of seitan and took his share of the green peppers. 5 stars. 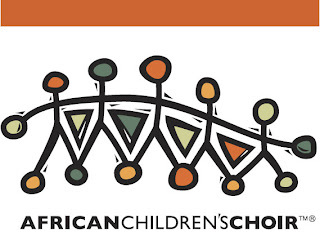 This weekend we were honored to act as a host family for some members of the African Children's Choir while they were in town as part of their U.S. tour. The children are ages 7 to 12 and come from several African nations (our guests were from Uganda). Many of the children have lost their parents to AIDS and other diseases, and all of them come from situations of extreme poverty. They sing and perform to raise awareness of the plight of these children of Africa, and to raise money for relief and education. Each host family was asked to send their children off today with a packed lunch. Hey, I thought, I can do that! Since we won't be seeing them again I made improvised bento boxes out of disposable plastic containers and used frozen water bottles as ice packs. 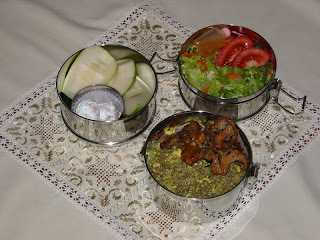 Into each lunch box went a homemade pita bread filled with my favorite Wild Garden Hummus and six baked falafel balls. Next to the falafel is a bento-style plastic food cup filled with lemon cucumbers and cherry tomatoes, with a squeezy-fish of dressing and a little food pick. Underneath the cup are some baby carrots you can't see. Verdict: Well, the Choir is on the way to Spokane now, so I won't really know how they like their lunches, but I hope they do. It was so much fun to meet them, to listen to them singing and playing, and to watch their amazing performance this weekend. (I think they burned like 8 million calories up there!) If the choir is coming to your town next, don't miss it. One of the things that struck me right away about vegan cooking was the amount of maple syrup called for in many recipes. It seems that a lot of vegan cooks rely on maple syrup to take the place of honey and sugar in recipes, particularly in baked desserts. I love me some Fruit Butter Bars in the fall, but with the price of real maple syrup going up and up (along with most everything else), I just can't afford to use that much of it anymore. 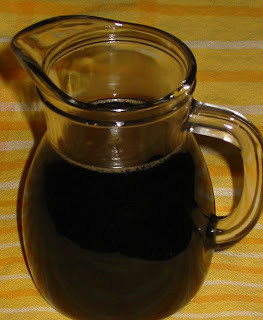 So, I devised this recipe for Homemade "Maple Syrup". It's very simple, made with brown sugar, a bit of cornstarch for thickening, and a spoonful of natural maple flavor. I bought 2 ounces of the maple flavor at my local health food store for $2.49; at one teaspoon per recipe the little bottle will make 12 batches of syrup. I know it's not the real thing, but in these trying times it's sure a tasty alternative, and with none of the chemicals and preservatives of storebought imitations. You might note that the cheap staples she uses in most meals -- pasta, potatoes, onions, etc. -- are vegan. In fact, except for the cheese sprinkled on at the end, this first meal is entirely vegan. In other economic news, people are cooking at home more and packing more home-made meals to save money. Let's hear it for home cooking! 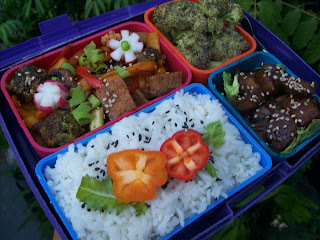 This post marks the beginning of a brand new lunch box adventure: VEGAN LUNCH BOX AROUND THE WORLD! It's that time of year again: the big end-of-summer eggplant/pepper/tomato harvest! And you know what that means: ratatouille! That's right, it's more than a cute cartoon! 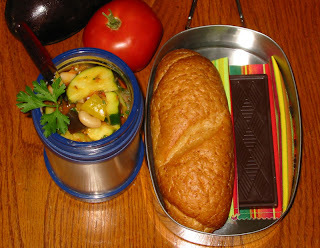 It's a classic French country stew made with eggplants, peppers, tomatoes, and zucchini. I added cannellini beans to mine, although the traditional recipe doesn't call for them. Alongside are a mini-loaf of wheat bread and a bar of Newman's Sweet Dark Chocolate (Newman's is our favorite dark chocolate -- smooth, not too bitter). Verdict: Ratatouille only gets better the next day and the day after, making this a great dish for next-day lunches. This was the perfect lunch to enjoy while watching shmoo's team practice another fall classic, at least in America: tackle football. (That's right, despite my better judgment we are allowing our kid to smash violently into other kids for fun. You should see the bruises.) 4 stars. I'm so jealous! Blog reader Kadri from Estonia read my recent soy-free vegan yogurt review and pointed out that they make Oat Yogurt in Finland! How cool is that? "My favourite non-dairy yoghurt has to be YoSa. It's oat-based and flavoured with real fruits and berries. "It's absolutely wonderful - their organic bluberry-banana YoSa and plum YoSa are incredlibly good as well. I'm not sure whether one can get it in USA, but if you can, give it a go. I'm sure you'll love it, too." I'm sure I would, if only I could! And your feet will smell like trout!" Check out these instructions from Evil Mad Scientist Laboratories ("Making the World a Better Place, One Evil Mad Scientist at a Time") on how to make your very own bicycle frame lunch bag. 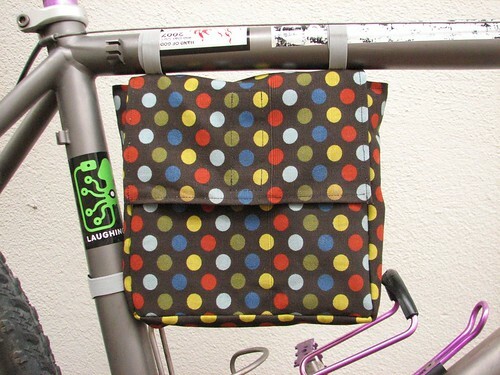 I wonder if you could adjust the pattern dimensions to fit a Laptop Lunch System? In case you missed it live, my recent interview with Dr. Melissa West is now in the archive. It was a fun interview! 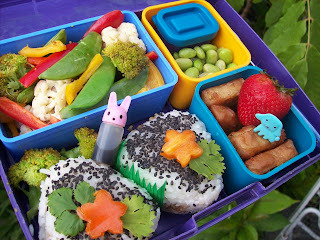 I couldn't resist giving out just one more Vegan Lunch Box award and free cookbook! 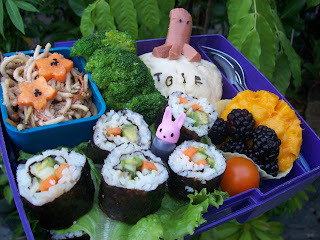 This one goes to Christine in Arizona, who sent in this adorable "Summer Bunny" lunch! "I grew up in Saskatchewan Canada, where every summer at afternoon I would be seated in my mother’s kitchen enjoying one of her delicious lunches. She used fresh vegetables from our garden, warm homemade breads and juicy fruit from the farmers market, which have also become some of my favorites as I continue to cook and grow. 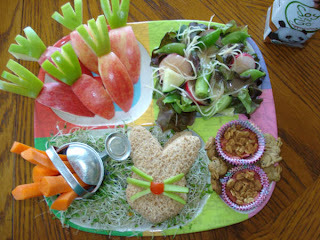 This Summer Bunny lunch was inspired by the cool Canadian summers in Saskatchewan that I miss terribly. "Starting from the top left, I made carrots out of Granny Smith and Gala apples, held together with toothpicks. Next I made a salad with organic red leaf lettuce with chopped sugar snap peas, cucumber and radishes. I sprinkled Galaxy brand Veggie Shreds (parmesan, mozzarella and romano flavored) for that yummy cheese texture. For the dressing, I used Annie’s Organic Pomegranate Vinaigrette, which was delicious! "On the bottom left I made a bunny-shaped sandwich (Athenos humus spread, sliced tomato and cucumber between whole wheat bread), a filled a mini watering can with sliced carrots (every bunny’s favorite food! ), all over a bed of alfalfa sprouts. For dessert, I made two mini servings of organic rhubarb crisp, a HUGE childhood favorite of mine, sprinkled with granola and ground cinnamon. I also added some of Annie’s vegan chocolate chip bunny grahams for a little variety! And for the drink... Soy on the GO Cappuccino (also comes in chocolate and vanilla)." Is that incredibly adorable or what? Thank you so much, Christine, for sharing your work of edible art with us! 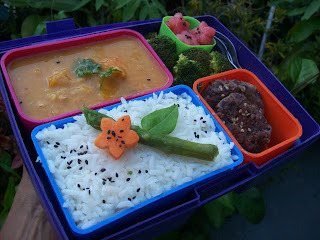 Here is the phenomenal Amy, Winner Number Five in the Vegan Lunch Box Contest. Amy is fifth in honor of the FIVE lunch boxes she packs for FIVE of her children. 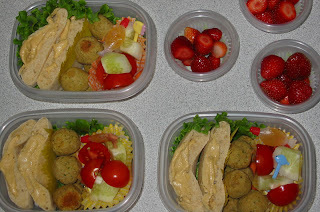 How she manages to pack five lunches at all is a mystery to me, not to mention the fact that all the lunches look delicious, healthy, and fantastic! The bottom left has Southwestern Eggrolls on a bed of brown rice with diced tomato on the side. The inside of the roll is tempeh, spinach, corn, black beans, onion, red pepper, jalepeno which is left out for the kids, tomato, chili powder, and cumin. My recipe is a copycat of Chili's Southwestern Eggroll recipe except I substituted steamed tempeh for the chicken and just omitted the cheese. They are baked instead of deep fried like the original. The dipping sauce is vegan avocado ranch for the eggrolls. I used toffutti sour cream, veganaise, and soymilk in place of the dairy in the recipe. The top left has carrots and cherry tomatoes from our garden to use with the rest of the dipping sauce. The top right is mango and blueberries. The bottom right is an attempt at a vegan churro. I used a vegan donut recipe and it came out a lot flatter than I anticipated and looks more like a cookie. The rolls and dip look delicious, and I love that they included my favorite soy food, tempeh. I'm so glad you took the extra time to photograph and share your family's lunch with us. Congratulations and thank you, Amy! Woo hoo! I love the passion and intensity she brings to this issue. 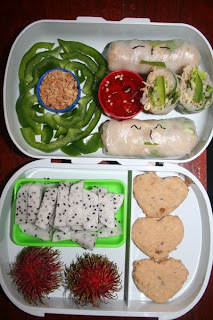 The fourth winner of the Vegan Lunch Box Contest is Candice, who sent in her entry all the way from her current home in Laos. Candice handily beat out all competition in the categories "Most Unusual Fruit" and "Funniest Lunch Box Logo". "In the red bowl is spring roll dipping sauce made from palm sugar, vinegar, water and chilies. The red bowl has a lid (Tupperware). In the blue bowl is ground peanuts that are sometimes dumped into the dipping sauce, but you can always just mash the spring roll down in there and get some peanuts on the end of it. The green stuff is bell peppers. The eyes on the spring rolls are hijiki seaweed. "On the other tray are dragon fruit (about 1/3 of an entire dragon fruit), two rambutans, and home made roll-out vegan oatmeal cookies. recipe for Roll-Out Vegan Oatmeal Cookies and I have posted it for all to enjoy. Thank you so much, Candice! I hope I have a chance to try rambutan and dragon fruit someday. They look like crazy Dr. Suess fruit to me -- I love it! For those of you interested in hearing me yammer on about lunchtime (as I do so love to do), there is an upcoming opportunity to do so: I'm going to be interviewed this week by Dr. Melissa West on her internet radio show Returning to the Body Mind. Dr. West is a "holistic lifestyle coach, psychospiritual energy worker and yoga and pilates instructor", and her show focuses on the connections between physical, spiritual, and personal well-being. She's interviewed some very interesting people, including vegan professional triathlete Brendan Brazier (scroll down to the 9/3/08 episode to listen to the archived show). The show will be going out live online at Contact Talk Radio this Wednesday, September 24th, from 8am to 9am PST. Listen in live at the website, or download the recorded show later on itunes. We'll be talking for a whole hour (can I really yammer on that long?) and will even take calls from listeners. So call and ask me your questions (be nice!) at 1-877-230-3062 while the show is going on. How could the cafeteria get any better? The USDA wants to know! The Child Nutrition Act includes legislation for the National School Lunch Program, which provides federal assistance for school lunches. This act is being reauthorized in 2009, and the USDA would like your input on what needs to change. Submit your recommendations for improving vegetarian options by fax at 703-305-2879, or online. They are accepting comments until October 15, 2008. PCRM has put together a list of recommendations that would make school lunches more veg-friendly and healthier for everyone, including offering nondairy milk alternatives, plant-based meal options, and more fresh fruits and vegetables. Not long after I posted my review of Deceptively Delicious a reader brought to my attention the existence of another popular cookbook with an identical mission -- to sneak vegetables into children's food unawares. It's The Sneaky Chef, and the author Missy Chase Lapin has a pending lawsuit against Deceptively's author Jessica Seinfeld for stealing her idea. It may be true that Seinfeld ripped her off, or it may be a case of two people coming up with the same idea at the same ripe time. The question for me isn’t who thought of it first (scores of parents over the generations have resorted to sneaking a bit of something into the mashed potatoes or muffin batter). The question for me is, which one does it better? If you're going to buy just one sneaking-mashed-vegetables book, which one should it be? After reading them both, I would recommend The Sneaky Chef. The author has really done her homework and most of her advice is right on: find fruits and veggies your kids like "straight up" and serve them that way (Method Six, page 76); slowly incorporate more whole grains into the diet (Method Two, page 67); avoid frying (Method Seven). Best of all, her purees actually sound yummy, with a touch of lemon juice and a wide variety of vegetables (the Green Puree, for example, includes broccoli, spinach, and peas). I actually want to whip them up and add them to meals, even in a not-sneaky way. But still, the initial bewilderment that I had when reading Deceptively still hits me as I look through the recipes here. Are children really so resistant to eating any fruits and vegetables that a tablespoon of orange vegetables hidden in boxed macaroni and cheese is a triumph? Sneaky even excitedly proclaims on its cover, "Blueberries hidden in cupcakes!" Blueberries? Really? Who needs to hide blueberries? I need to hide the fresh blueberries away from my son so he won't eat them all in one sitting. But Lapin's personal story of mealtime struggle brought home to me just how hard it is to get some kids to eat healthy foods, and caused me to cheer for her when she finally hit upon stealth techniques that worked and brought her some relief. Hey, whatever it takes sometimes! More power to you, sneaky momma! 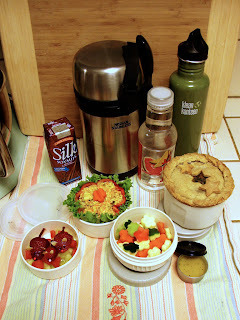 This contest entry from Sherrila in California won my heart with a beautiful lunch container and a meal fit for a king -- or, in this case, a very hungry vegan husband! Let's start the description on the bottom left with heart-shaped melon salad with a trio of adorable strawberry mousies on top. Next to it is a bell pepper filled with tofu salad and a salad of flower-shaped carrots, peppers, and zucchini, and a container of dressing on the side. The hearty main course is a "Tuscan-inspired" pot pie filled with spinach, cannelini beans, and apple-sage vegan sausages from Field Roast. That pie sounds sooo good right now -- I love Field Roast! 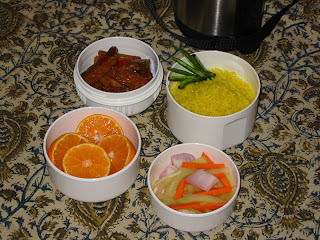 For more pictures of lunch and lunch box, along with a more detailed description of contents, check out Sherrila's contest entry pdf. It's so beautiful, Sherrila! You have one lucky husband. Keep up the good work! 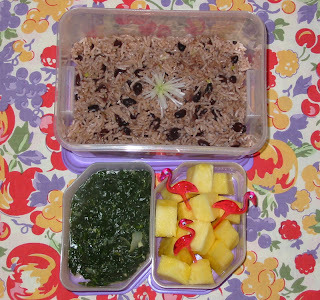 Here is Winner Number Two in the Vegan Lunch Box Contest: the Amazing Aracelis from beautiful Puerto Rico! Aracelis had by far the most entries in the contest, but any one of her artful vegan lunches would have won it for her on its own. 1. "This is 'Chinese Take-In'. Home made Szechwan eggplant, barbecued tofu stir-fry (with broccoli, tri-colored peppers, cauliflower and mushrooms), white rice garnished with pepper flowers and black sesame seeds; and to round off the lunch: more broccoli. This was a nice and decadent lunch." 2. "This has been my favourite lunch so far. The contents are: steamed broccoli, cauliflower, snap peas and tri-coloured peppers. Edamame; with a BBQ sauce container. Strawberry and vegan chickn bits; and lastly onigiri (omusubi) filled with mushrooms sauteed in hoisin sauce. I could eat this every day!" 3. "This is a simple lunch, but it really hit the spot. Lentil soup, rice, broccoli, watermelon, and black bean mini burgers. The soup was made by my mom, specifically to accommodate me. She's really sweet!" 4. I call this 'TGIF Bento'. Everything (except the tofu dog) was home-made. The contents are: sesame noodles, maki sushi (avocado, carrots and cucumber), char siu seitan steamed bun, broccoli, tofu octodog, mango, blackberries and a tomato. It was a really good lunch and good way to end the work week." Congratulations, Aracelis! Thank you so much for sharing all your wonderful creations with us!